One of downtown South Milwaukee’s longstanding businesses is being rebranded and rethought — and it promises to be a winner. 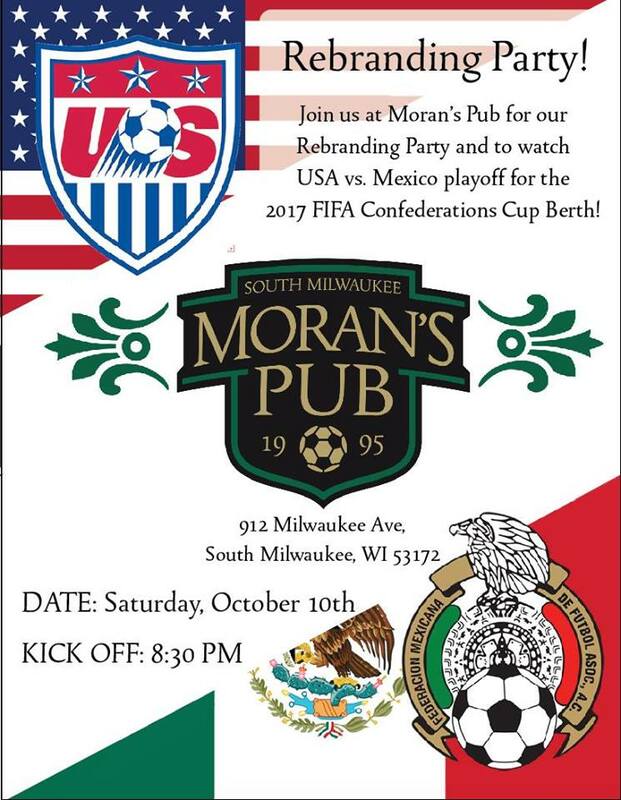 Moran’s Pub, 912 Milwaukee Ave., is becoming a soccer pub, one of only a handful in the area. The transition is underway, as the Moran family have their son, James Moran, handling the weekend soccer responsibilities. Look for the new logo (you can see it above) and signage soon. Other changes to come include six new 60-inch HD TVs, various soccer memorabilia, an increased craft beer selection from local and national breweries, and small food options. They will also have their back room open for private viewing parties, and overflow during large games. They’ll be kicking off their re-branding party this Saturday, starting at 8 p.m. with a formal ribbon cutting followed by the start of the United States-Mexico match at 8:30. Moran’s will have Cecilio Negrón Jr. and Julio Pabon of De La Buena and Samba da Vida bringing their Brazilian flair to the pub for the party, which will include Mexican chips and salsa from Azteca Restaurant down the block. The transition becomes official with a big event planned for Saturday, October 17. That’s when former U.S. Men’s National Team, Premier League and Major League Soccer player and Green Bay native Jay DeMerit comes to town for the grand opening as part of a series of events the Milwaukee Soccer Development Group (run by James Moran) is hosting that day. DeMerit’s appearance at Moran’s is set for 11 a.m. to 2 p.m., for a viewing party of a big game in the Premier League: Watford vs. Arsenal. Cost is $25 per person, which includes a pint and a sandwich, and the opportunity to watch the match with the former Watford player and only Wisconsinite to ever play in the English Premier League. There will also be a live auction of DeMerit memorabilia. Half of the proceeds go to the Jay DeMerit: Rise & Shine Foundation, and the other half go to the Milwaukee Soccer Development Group, a nonprofit organization dedicated to promoting soccer and providing opportunities for youth to play soccer in under-served communities in the greater Milwaukee area. Tickets are available from http://www.msdgsoccer.com. Jay DeMerit’s story is one of a young American’s impossible journey from Green Bay, WI – a journey never experienced or heard of in the soccer world. After not making the professional leagues in the U.S., Jay left for Europe at the age of 21 without any professional experience – only a passport, $1500 and a backpack full of dreams. After scraping by for almost two years, Jay finally got his chance. Based on one tryout in the final preseason game, Jay signed a professional contract with Watford F.C. He then helped his team earn promotion to the English Premier League by scoring the “40 million pound goal” and became an instant hero in England. Jay went from playing in front of 50 people to 50,000 almost overnight. I’m really excited about downtown’s latest new business. This will be the only soccer pub in the area, and it’s certain to attract new people to our city center and provide new life to the 900 block of Milwaukee Avenue. I am already thinking of the 2018 World Cup — I know James wants to go big, and I’m excited to see what that will mean for his business and our city. My hope: Moran’s joins Highbury, Three Lions and Nomad as one of THE go-to soccer bars in the region. With James’ passion, I think it will get there. Soccer fan or not, be sure to check out the new Moran’s! PS Your hyperlinks are incorrect. Great logo Jim, and good luck with this new “Brand”. This is Awesome can’t wait to visit! Love the logo Best of luck!